As I mentionned in my last post, we're in serious negotiations to get the game signed. This means that until the signatures are inked on the contract, we have to stay quiet about ITSP. Fuelcell have been making lots of progress on the technology side of things and I personally can't wait to get back in the saddle in March 2010, when we are scheduled to resume full production. In the meantime, I'm going to be doing a series of post called "Shadow Tidbits", which will display some of my artwork past and present, that features shadow silhouette imagery. This is kind of a follow-up to "My History with Shadow Puppets" posts I've been doing these past weeks. 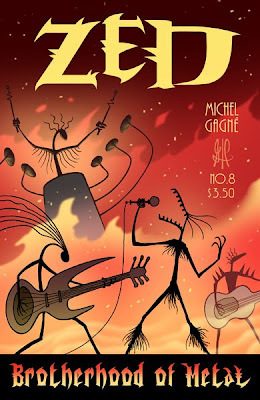 First up, is the cover of ZED #8, which came out in March 2007. ZED is a comic series I started in 2001, and I've been doing one issue a year ever since. I'm planning on releasing the final issue, ZED #10, in September 2010, exactly 10 years after the release of issue #1. ZED is the story of a cute and adorable alien scientist who discovers a clean and efficient way to produce energy. When he demonstrates his invention , he inadvertently triggers a deadly chain of events - a monumental disaster that claims the life of his parents, the hierarchy of the galaxy, and 60 billion beings. Suddenly, his dreams of offering his society free energy become a nightmare as little ZED must come to terms with the knowledge that he caused the death of his parents and the annihilation of an entire planet; and now he's a pariah, hated by virtually everyone. As the story progresses, we realize that things may not be as they seemed at first. Among the comics' recurring cast, is the Heavy Metal shadow band called Krah which is features here, on the cover of ZED #8. More on ZED at www.zedcomics.com. I was just wondering why things had been so quiet on your wonderful-looking game. I absolutely cannot wait - it looks like it's made from pure win. Best of luck with the negotiations!